Ski rental in Axams: Try a new sport each day! Deep snow today, tomorrow racetrack and the day after halfpipe: The ski region Axamer-Lizum convinces by multifaceted winter enjoyment for recreational athletes, families and professionals. You want to experience a new snow adventure each day? Then there is no way bypassing INTERSPORT Olympia, Axamer Lizum - Hotel Olympia next to parking lift: The experienced INTERSPORT Rent coaches are happy to present the wide range of skis, snowboards and fun equipment for sale or rent. "The impossible we do immediately, the miracles take a little longer" - that´s the slogan at INTERSPORT Olympia Axamer Lizum - Hotel Olympia next to parking lift. 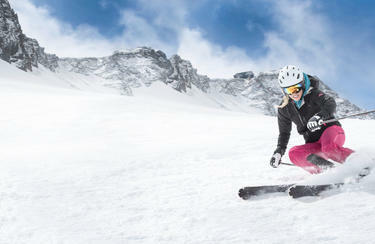 The commitment and expertise of the INTERSPORT Rent coaches guarantee best equipment at best prices for winter athletes. Whether cross-country skis, snow blades or twin-tip ski - you can decide for a new pleasure each day anew. The straightforward rental service in the ski rental in Axams enables that! Get FREE information for your holiday in Axams to your mobile! The shop assistants are able to provide personal service, eventhough a lot of other customers are in the shop. Friendly, experienced and nice staff! Sehr nette und hilfsbereite Verkäuferin. So macht es Spaß.